Gary Lee Partners worked with this manufacturer of high quality contact wood furniture for a number of years developing a new complete furniture collection. 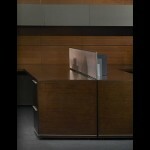 In 2005, the casegood line was launched at NeoCon along with prototypes of additional collection pieces. In order to accommodate the new line, the showroom was expanded to double the original size from approximately 1800 to 3600 sqft. 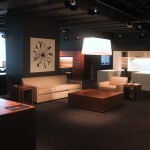 The goal of the showroom expansion was to bring the existing design into the new space to look like united and whole. 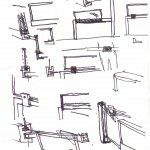 The layout remained simple and open for the maximum flexibility for future vignettes as new collections develop and change. The finishes and materials from the previous year’s design were seamlessly incorporated into the new space. 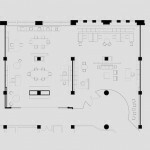 The design intent was to create a gallery experience. 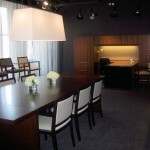 The finishes were dark neutrals using lighting to highlight the vignettes. 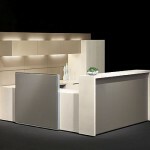 Due to the success of the casegood products, the expansion of the line was launched at NeoCon 2006. 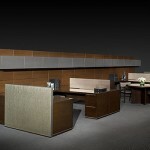 The expansion provided a complete office solution including lounge seating, occasional tables, conference tables, guest seating and a unique panel system incorporating the flexibility of an office system line with the aesthetics of built in millwork. The line proved to be the most successful line the manufacturer had produced. Both the showroom and the furniture designs are timeless and adaptable, with the ability to adjust from formal traditional to sleek modern settings. 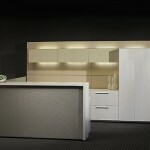 My involvement in the project was with the expansion of the existing showroom and it’s reconfiguring the following year. I was involved in the entire construction process from field verification through construction administration as well as adjusting lighting on the furniture vignettes and purchasing accessories. 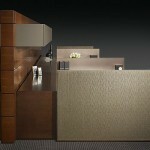 As the product line developed, my involvement continued. 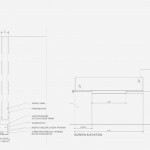 Beginning with drawings previously developed, I worked with the manufacturer on details through the fabrication process. I assisted the manufacturer’s photographer with the shot selection of the new panel system product and provided input on the new brochure layouts. In addition, I attended the pre-NeoCon meeting for the sales representative and was present for questions during NeoCon.